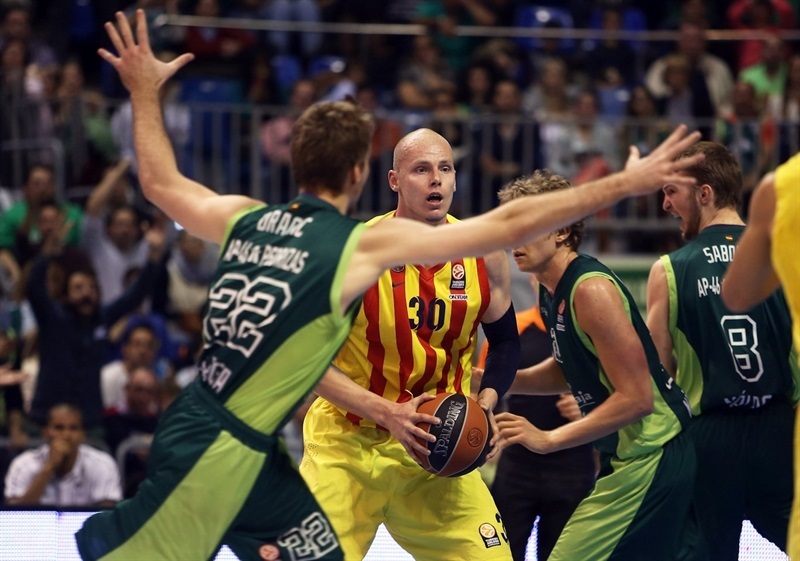 FC Barcelona remained undefeated in Top 16 Group F and came a step closer to clinching first place by downing Unicaja Malaga 61-77 on the road in front of 10,600 fans on Friday. Barcelona improved to 11-0 and will seal first place with its next win - or the next loss by EA7 Emporio Armani Milan. Unicaja dropped to 5-6 and is tied for fourth place. Bostjan Nachbar paced the winners with 16 points. 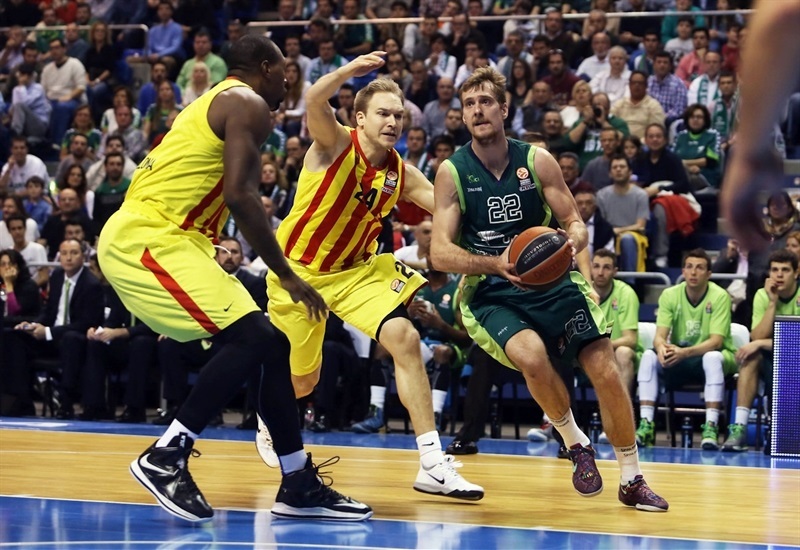 Ante Tomic and Erazem Lorbek each scored 12 for Barcelona. Tomic added 10 rebounds for a double-double. 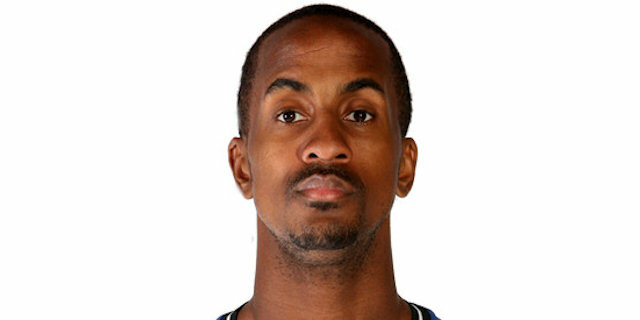 Earl Calloway led Unicaja with 15 points. Mindaugas Kuzminskas added 13 while Vladimir Stimac had 11 for the hosts. 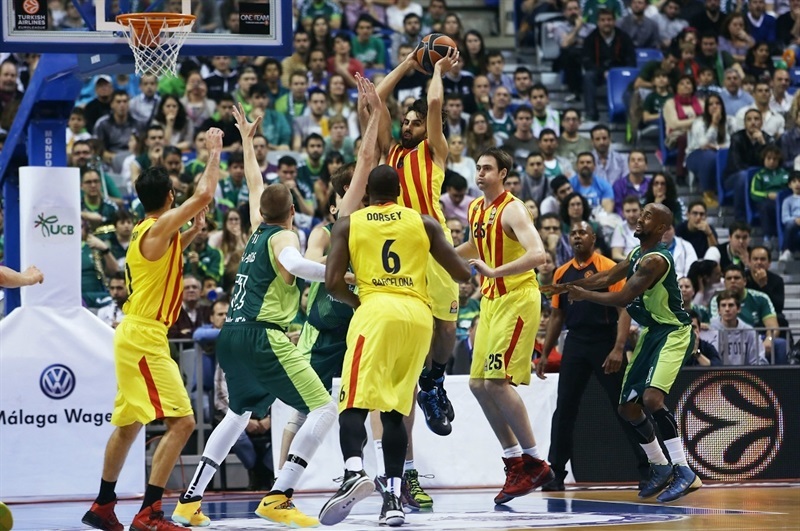 Juan Carlos Navarro led an early 0-8 run, which allowed Barcelona to keep a 17-21 lead after 10 minutes. 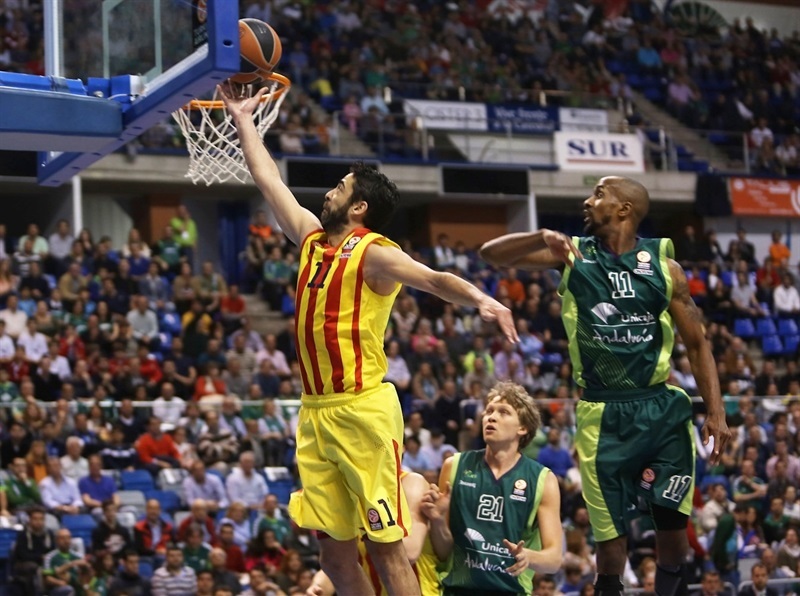 Barcelona kept excelling on defense and a dunk by Kostas Papanikolaou made it a double-digit game. Calloway and Kuzminskas brought Unicaja within 31-37 at halftime. An outstanding Marcelinho Huertas struck twice from downtown in a 0-8 run that gave Barcelona a 31-45 margin right after the break. 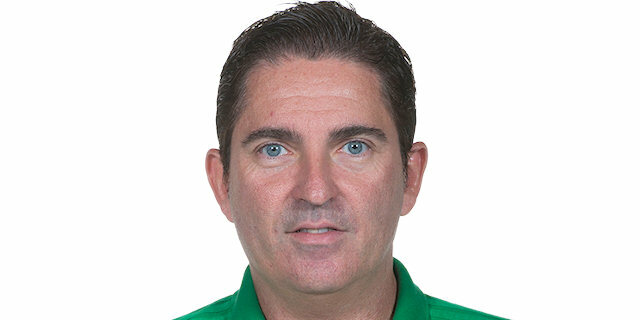 Fran Vazquez and Kuzminskas rescued Unicaja, leading a 13-2 run that brought the hosts within 44-47 late in the third quarter. But Barcelona improved its defense, boosted its margin to 47-55 at the end of the third quarter and then again to 47-65 behind an unstoppable Nachbar to seal the outcome long before the final buzzer. 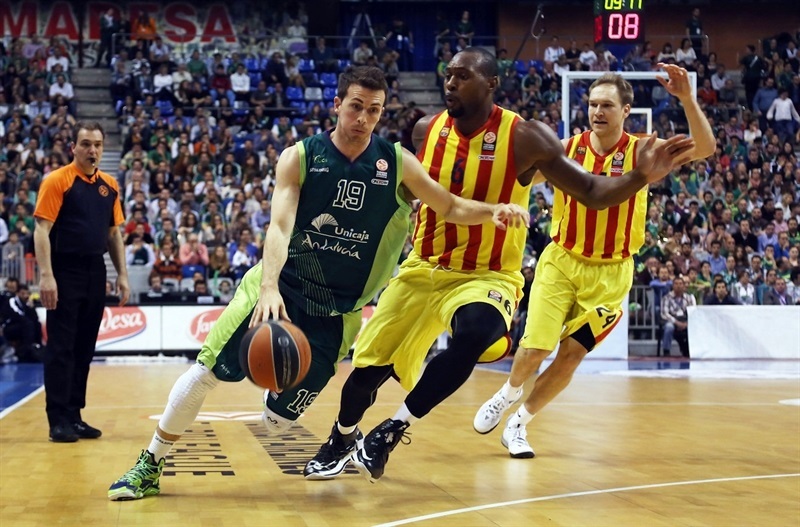 Erazem Lorbek got Barcelona going with a close basket, which Earl Calloway bettered with a three-pointer for a 3-2 Unicaja lead. Kostas Papanikolaou answered from downtown and Juan Carlos Navarro followed a fast break layup with a corner triple for a 3-10 Barcelona edge, after a 0-8 run. Mindaugas Kuzminskas hit 3 free throws, before Marcelinho Huertas shined with a running basket. Another three-pointer by Calloway brought Unicaja within 9-12. Ante Tomic nailed a turnaround jumper off a timeout, but Calloway buried his trademark stop-and-pop triple. Tomic kept pushing Barcelona with back-to-back layups. Zoran Dragic split foul shots, as Unicaja tried to open the floor with Carlos Suarez at power forward. 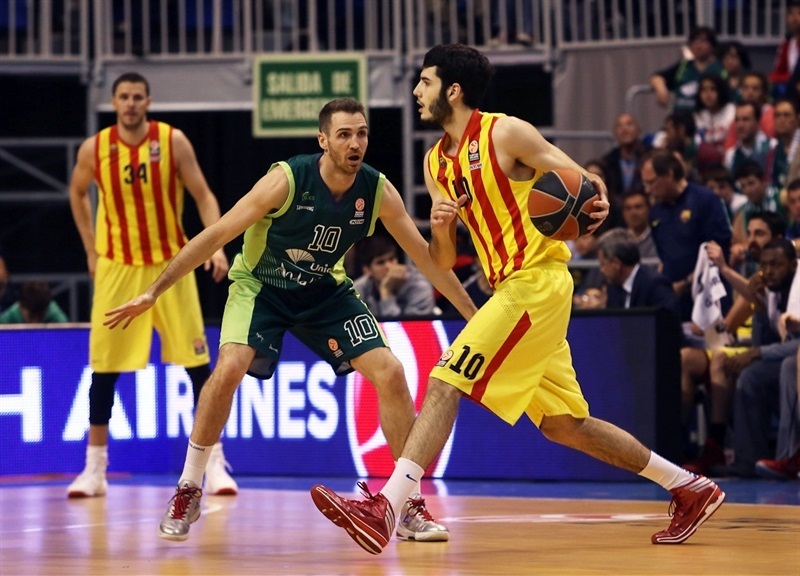 Alex Abrines swished a triple before a layup by Vladimir Stimac - Unicaja's first two-pointer - kept the hosts within 6. Another close basket by Stimac fixed the score at 17-21 after 10 minutes. Joey Dorsey fed Bostjan Nachbar for a two-handed dunk early in the second quarter. Stimac beat the shot clock buzzer with a layup and a three-pointer by Txemi Urtasun ignited the crowd at 22-23. 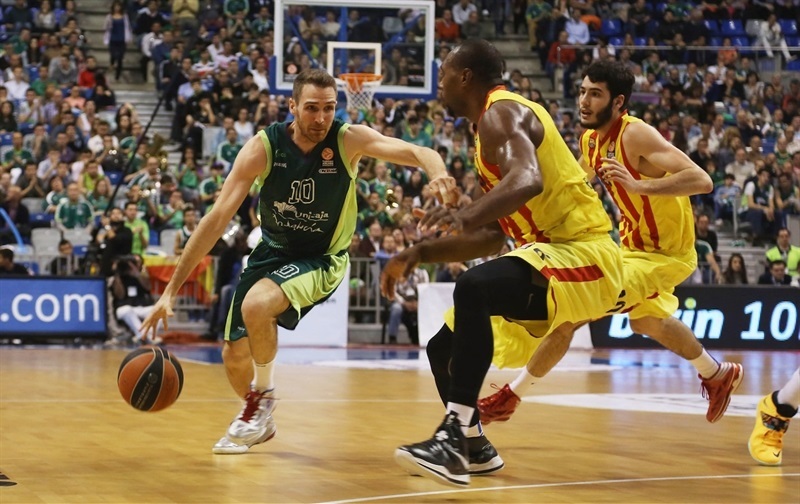 Barcelona struggled to score without Huertas and Navarro on court. Tomic stepped up with a jump hook and a block on Stimac which allowed Abrines to give Barcelona some fresh air at 22-27. Stimac took over with a dunk that Tomic erased with a layup for a 24-29 score. Unicaja kept picking up turnovers and free throws by Jacob Pullen made it an eight-point game, 24-32. A wild fast break dunk by Papanikolaou soon gave Barcelona its first double-digit lead, 24-34, after a 0-7 run. Unicaja called timeout and Calloway hit a five-meter jumper but Lorbek answered from downtown. 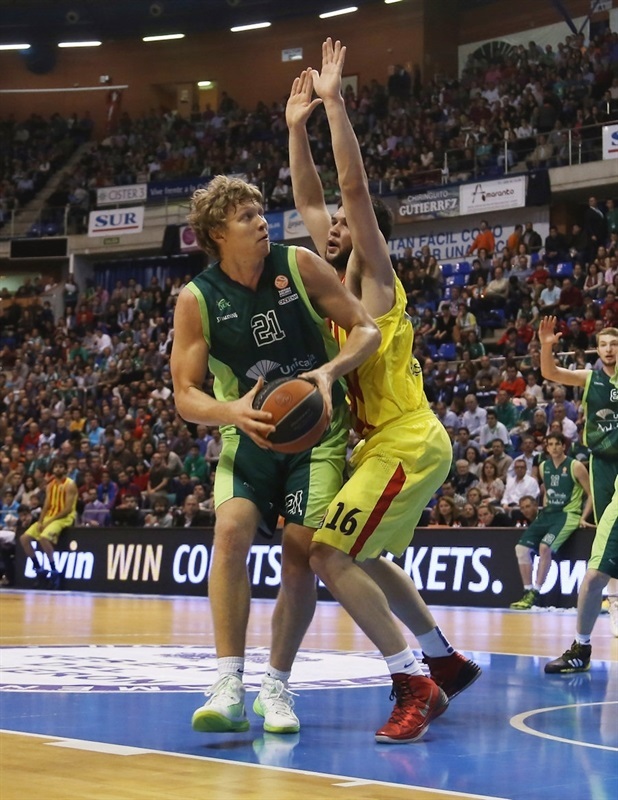 Kuzminskas followed a triple with a layup to bring Unicaja closer, 31-37, as both teams returned to the locker rooms. 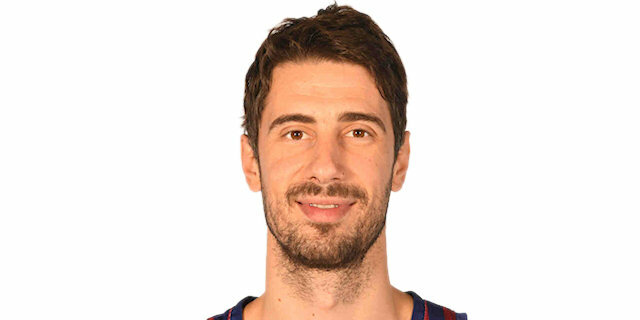 Huertas buried an off-balance three-pointer immediately after the break, as the guests dominated the boards through Tomic, whose put-back basket – his fourth rebound in 90 seconds – gave Barcelona a 31-42 lead. Another triple by Huertas forced Unicaja to call timeout at 31-45. Vazquez stepped up with a dunk and the guests started to miss open shots. 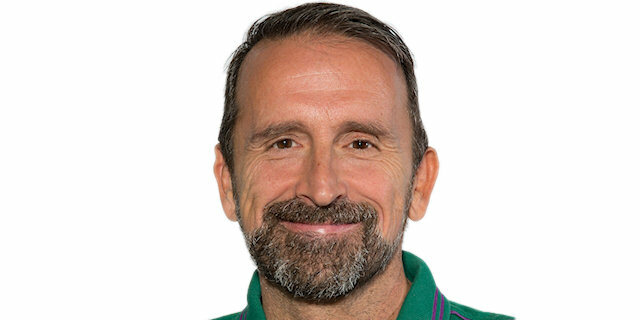 Meanwhile, Dragic tried to change things with a backdoor layup and a fast break basket and Barcelona called timeout at 37-45. 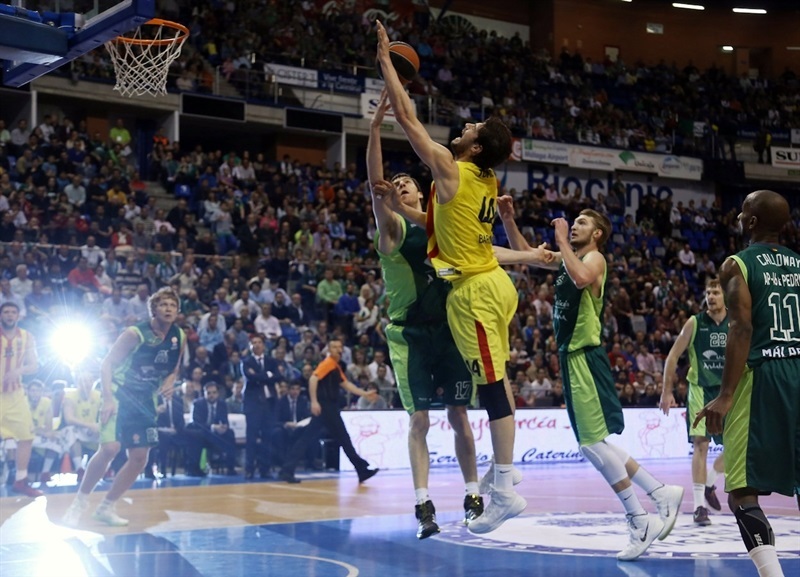 Kuzminskas ignited the crowd with a dunk and bettered Nachbar's free throws with a three-pointer that brought Unicaja back to life at 42-47. Vazquez swished a jumper, but Papanikolaou answered with a fast break layup and Nachbar followed a six-meter jumper with an easy basket that saw the hosts call timeout at 44-53. Nachbar remained on fire with another fast break basket, but a layup-plus-foul by Stimac kept Unicaja within 47-55 at halftime. Nachbar struck from downtown early in the fourth quarter and soon added another three-pointer that broke the game open, 47-61. Lorbek scored twice around the basket, forcing Coach Joan Plaza to call a much-needed timeout at 47-65. 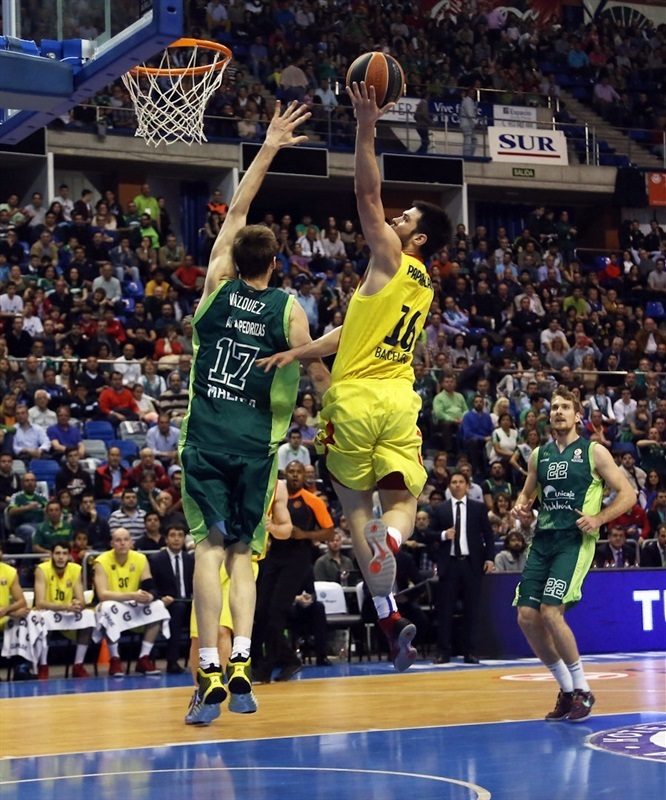 Unicaja was held scoreless for almost four minutes until Domantas Sabonis stepped up with a put-back basket. Brad Oleson did better with a three-pointer that sealed the outcome, 49-68, with less than six minutes left. After Calloway downed a mid-range jumper, Lorbek struck from downtown and Oleson made it a 21-point game. Urtasun and Sabonis tried to change things for Unicaja, but Dorsey silenced the crowd with a huge slam and by the time Abrines scored again, everything was said and done. "The first thing is to thank the fans who came today for their support. They filled the arena and I am very happy. They did not stop cheering. We had quite a few turnovers and we had problems with Barcelona's physical game. Despite this, we did not give up. We were fine in intensity and fight, but Barcelona put up points and put up points, and we found it difficult to get close on the scoreboard. Now come hard and physical matches in both competitions and we have to keep working." "We are very happy with the win in a game that we knew would be difficult, with great atmosphere and a full arena. We've played well at the defensive end. In the first half, we were not very successful facing the basket. In the second, we continued to defend well and we were much more successful and that has been the key to the victory. We moved the ball very well and we got good shots from the three-point line. The team worked very well for 40 minutes." "It was a very intense match from the start. They got a small advantage early and from there we had to work very hard to try to keep close on the scoreboard. After the break, they got an important ruun that in the end was key to their victory. I want to say thank you for coming to our fans, for their support. The atmosphere was great." "The game was very hard and very intense. We knew that winning in Malaga was not easy and we have had to strain to our maximum to achieve this victory. We started the game very well, very concentrated on defense and attack. At halftime, the match was even. After the break, we did very well and we got an 8-0 run that was very important for the final victory. We improved our defense from there and did well on the fastbreak. We are pleased to stay unbeaten in as hard a group as this one is."